It was a festive moment for the Town of Cicero and Walmart Wednesday morning when the doors officially opened to Walmart Supercenter, 33rd and Cicero, giving community residents a whopping 191, 000 sq ft space filled with an assortment of goodies to enjoy. Walmart Supercenter officially opened on Wednesday, May 21st helping to generate more than 400 new jobs in the West suburban community. According to Perez, job opportunities are still available. Walmart officials said more than 8,300 people submitted applications for the jobs during hiring events coordinated with the Town of Cicero. At the ribbon cutting ceremony performances included the Morton High school Marching Band and the Morton High school Mariachi Band. Town officials who participated at the opening included Town Clerk Maria Punzo-Arias, Supervisor Joe Virruso, Collector Fran Reitz, and Trustees Dennis Raleigh, Victor Garcia and Larry Banks. Assessor Emilio Cundari and Trustee Lorraine Walsh both saluted the Walmart. Also present at the store launch were representatives for local officials including State Senator Martin Sandoval, State Senator Steven Landek, State Rep. Lisa Hernandez, State Rep. Mike Zalewski and State Rep. Silvana Tabares. Perez went on to discuss Walmart’s health and wellness program designed to help customers live a healthier lifestyle. Throughout the year, Walmart Supercenter will conduct health events such as, health screenings and community outreach while talking about their prescription program. Another feature customers should be aware of is their Walmart Service feature. Customers, who lack time to shop, can visit the Walmart Service near the pharmacy department, submit their items list and a Walmart representative will do the shopping for them, free of charge. 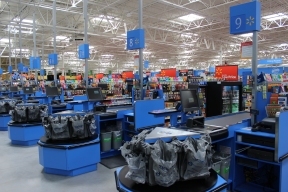 “This is just another feature we have here at Walmart to help our customers out,” said Perez. As we head into Memorial Day weekend, Perez, along with the rest of her Walmart team, encourages residents to take advantage of their low prices, ‘after all, our motto is ‘save money, live better,’ and that is what we want our customers to know about us,” said Perez. © 0612 Chicago Hispanic Newspaper, Lawndale News, Hispanic Bilingual Newspapers, Su Noticiero Bilingue. All rights reserved. XHTML / CSS Valid.